One Small Step for Man, One Giant Weep for Mankind? At the end of World War II, tensions between the US and USSR escalated into a nuclear arms race. Missile technology was developing fast and scientists soon recognised they could exploit this to launch rockets into space. The first step in space exploration came in 1957 when the Soviet Union launched the Sputnik 1 satellite, a huge blow to the Americans. To add insult to injury, the Soviets then sent the first man into orbit four years later. With these devastating blows dealt, America were roused to deliver a spectacular feat. Space Race – Goose Chase? The US government should keep the taxpayers’ interests at heart, this is their main duty to the public. Kantian ethics states that people have a duty to do the right thing, regardless of the consequences. The US government’s direct duty is to fulfill their taxpayers’ interests by investing back into society to benefit the public as much as possible. In 1966 alone, the US government allocated $5.9 billion to NASA and only $4.3 billion to education. Satisfying mankind’s curiosity to explore the Moon had no immediate benefits to American citizens, thus the US government did not fulfill their duty to its people. Had the $5.9 billion been invested in public health, education or infrastructure, the US taxpayer would have seen significant improvements to society. This was clearly a concern for American citizens at the time as public opinion about funding trips to space was never clear cut during the 1960s. Kant also described another principle, universalisability, where an action is only permitted if it can be extrapolated to all people. This can be applied to the US government’s funding of NASA. Would the government have comfortably put themselves in NASA’s shoes, knowing the potential implications of a major disaster? According to Kantian ethics, America should not have sent man to the Moon. However, Kant’s theory does not acknowledge the consequences of a decision and it applies general moral principles to all situations, regardless of the details. While Kant’s theory examines the duty that the government have to the public, care ethics considers the relationship between these two parties. The same conclusion can be reached from a care ethics perspective, as the relationship between the public and the US government is one of trust. The government is obliged to care for its people but they neglected this relationship by spending taxpayers’ money on the race to the Moon and not on public services, despite the obvious opposition. Unlike Kantian ethics, virtue ethics dictates that decisions should be made in a manner most aligned with an actor possessing the ideal personality traits. If the traits of an actor are flawed, then any decision this actor makes is likely to be unethical. America portrayed the decision to send man to the Moon as a great step for mankind, exhibiting noble characteristics such as ambition and determination. However, the underlying motivations were of an egotistical nature to demonstrate America’s superiority over the USSR, which led to a neglect of the public’s interest. America showed unvirtuous traits and displayed a lack of regard for the public. Virtue ethics would suggest America made an immoral decision in sending man to the Moon. With this in mind, what could possibly justify the Apollo mission? It’s Not All Doom and Gloom, We Can Go to the Moon! Sending man to the Moon spread happiness around the world, with 600 million people tuning in to watch. We have profited from many technological advancements, such as satellites and microelectronics, which continue to bring a whole host of benefits to this day. What’s more, it created thousands of jobs, whilst also inspiring the next generation of engineers and scientists. However, we cannot forget that the Space Race took the lives of eight American citizens and cost the taxpayer the equivalent of a colossal $150 billion. Although the American public at the time missed out on investment into public services, how could we overlook the technology that we now take for granted in everyday life? From a utilitarian perspective, surely sending man to the Moon was the right thing to do. But then again, America could never have predicted the spin-off technologies that we now enjoy. This demonstrates a problem with utilitarianism; it is difficult to apply retrospectively because it is hard to ignore the true consequences of a decision. Situational ethics differs from the theories of Kant and utilitarianism in that it considers the importance of the context of a decision, and as such has no absolute method of distinguishing right from wrong. The underlying philosophy of situational ethics is that each unique case requires a unique solution. Without consideration of the position America was in, one could argue that there was no moral basis for the Apollo mission. The billions of dollars spent and the deaths of American citizens could have easily been avoided by simply not joining the race. “The exploration of space will go ahead, whether we join in it or not, and it is one of the great adventures of all time, and no nation which expects to be the leader of other nations can expect to stay behind in the race for space.” Surely to sit back and let the Soviet Union undertake this great mission for mankind would have been an unthinkable course of action for America? Our initial decision is that America should have sent man to the Moon. Nice article but it seems to have a very limited scope. This focuses very much around America and expenditure. What would the world be like if Russia or China had been first to the moon? or if we had never made it? How would this race have been affected if more people had died during the first attempts? NASA were essentially given a blank cheque to put man on the moon, they could have been given less funding and sill made it, just a few extra years later. Personally, I disagree with the notion that they didn’t know the technological knock-on effect to going to the moon. It’s been proven in history that when people face a great challenge huge technology advances occur, this is most prominently shown through war. I think this is very interesting, especially considering just yesterday President Trump has directed NASA to return astronauts to the moon. Mike Pence said: “The United States were the first nation to reach the moon in the 20th century, so to, we will be the first nation to return astronauts to the moon in the 21st century”. I agree with your statement that: the government should make decisions with the taxpayers interest at heart. These decisions should be based on where funding goes and what on. I read that 13.5% of US citizens (40 million people) live in poverty. This begs the question on where funding should go. I personally believe more money should be directed to the US citizens, especially those in poverty, to help and improve their livelihood (healthcare, education etc). I therefore think Trumps decision to return of astronauts to the moon is unjustifiable and not worthwhile. While I agree with you that sending man to the moon in the 20th century was beneficial, after reading your article I think that resending astronauts to the moon is beyond stupidity and selfishness and that funding should be directed towards the US citizens instead. I’m struggling to convince myself of the integrity of your article when you’ve made such a glaring misjudgement with your choice of pictures and captioning. 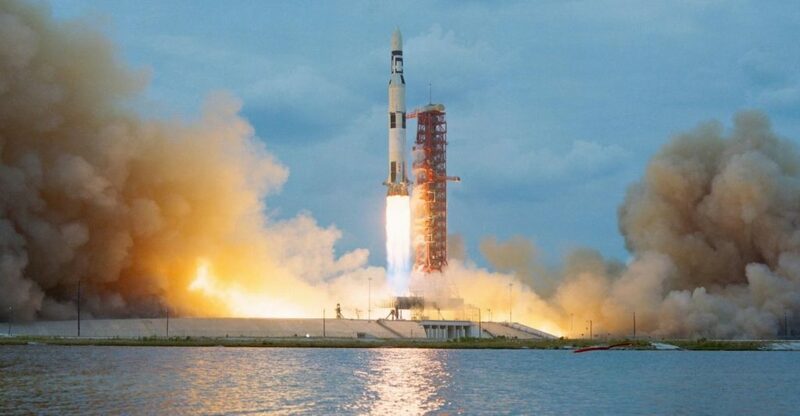 Titled ‘Saturn V Rocket launching astronauts to the Moon’, the final photograph of your article clearly depicts the launch of SL-1, the unmanned launch of Skylab. This is not a mission launching astronauts. It is not a mission destined for the moon. It is not even a Saturn V.
Skylab was a modified Saturn V, left over after the shortening of the Apollo programme, in which the upper stage was converted into a manned orbital laboratory. Thanks for highlighting the incorrect rocket in the image, I’d change it if I could. However to say this is a glaring misjudgement is a bit unreasonable. As you said yourself, Skylab was a modified Saturn V rocket and is clearly very similar in appearance. We focused on learning about ethical theories and producing an informed discussion, not playing spot-the-difference between each of NASA’s rockets. May I make a suggestion that you consider reading the article, instead of just criticising the images. Maybe then you’d be able to leave a more meaningful comment.